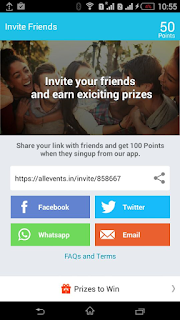 Hello Guys This Time we Brings An Amazing Offer from All Events App. This App Is Giving 100 Points Per Refer And You Can Redeem These Points As BMS Voucher, Recharge And Many More Coming Soon. For BMS Voucher You Will Be Needing 350 Points So You Just Have To Refer 4 Friends And You Will Get A BMS Voucher For Azhar Movie Worth 150 Rs . Its A Limited Offer Deal As Voucher Offer Gets Ended So Guys Go And Grab Your Seat For BMS Voucher. All Event Is All About Discovering Upcoming Events Happening In Your City. Find Out Where Your Friends Are Going. Get Event Recommendations Based On Events You Have Attended And Never Miss Out On Your Favorite Artist’s Concerts, Conferences, Festivals, Music Gigs Or Sports Events. 2.Open the App And Then Go to “Me” Menu Option. 3.Login With Your Facebook Account And Allow Facebook Permission To The App. 4.Now, Go To “Me” Menu Option Again. 5.Scroll Down The App Page And Here You Can See “Refer and Earn” Option, Click On That. 6.Share Your Refer link With Friends Or Relatives. 7.You Will Get 100 Points Per Refer And Referral Also Get 50 Points As Joining Bonus With Your Refer link. 150 rs movie Voucher Worth 350 points. Flipkart 500 rs voucher coming Soon. Snapdeal 500 rs voucher coming Soon. 1.AE Wallet earned through Invite and Earn Program will fall under promotional AE Wallet. 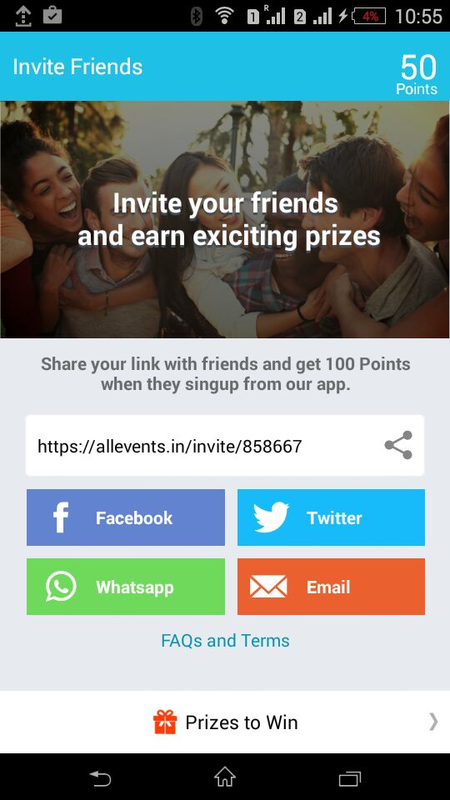 2.You earn 100 points for inviting friends when they install the app with your link. 3.An email_id can be used only once for creating an account on All Events in City. 4.When a user makes a booking by using promotional AE Wallet, in the event of cancellation of the Event, the promotional AE Wallet used shall be credited back to user’s AE Wallet account as promotional AE Wallet. 5.All Events in City reserves all rights to change the amount conferred under the ‘AE Wallet’ scheme at any point of time. 6.All standard All Events in City terms and conditions as described on allevents.in are applicable on AE Wallet earned through this program. 7.All Events in city has all rights to terminate/retract/cancel any user’s AE Wallet account if any misuse or unethical behaviour is observed. 8.This offer cannot be clubbed with any other promotional discount or exchanged in cash. 9.All Events in City reserves the right to change or withdraw the offer, any time at the sole discretion of the management.